Nite Nite Spider Mite is specifically designed to target spider mites. This amazing product works to condition your plant leaves to make them an inviting habitat for spider mites to reside in. This not only aids in treating the original outbreak, it also works to prevent any future invasions of these nasty pests. 100% organic, it will stop spider mites in their tracks by suffocating the adult spider mites which then works on drastically decreasing the spider mite population. 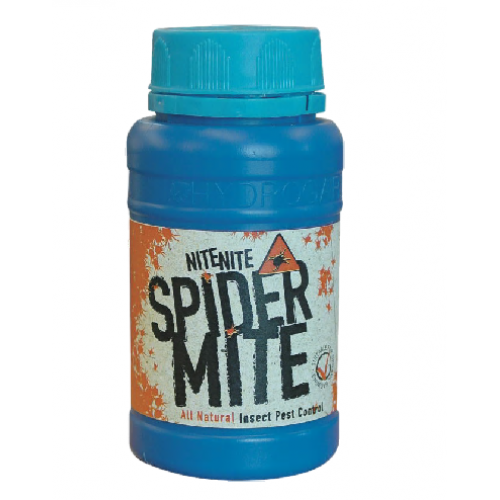 Nite Nite Spider Mite is safe to use once your plants have taken root. You may continue to apply this product until the final 2 weeks of growth. It is safe to use on all types of plant including fruits, herbs, flowers and vegetables. Nite Nite Spider Mite is naturally derived from organic plant extracts. It not only kills the spider mites and prevents new outbreaks, but it conditions your plants to naturally fight them off. Directions for use: Add 25 ml per 50 ml of water. Add to foliar sprayer. Spray evenly over all surfaces, making sure to get the underside of the leaves. Let it sit overnight. Not recommended for use with stressed plants or cuttings. Properly discard any remaining solution after 6 hours. It is important to never use sprays with the same active ingredients as this will cause the spider mites to become immune.